University College London (UCL) is London's leading multidisciplinary university, with approximately 11,000 staff and over 40,000 students from 150 different countries. UCL operates in a global context and is committed to excellence, innovation and the promotion of global understanding in all activities. The UCL Institute for Risk and Disaster Reduction (IRDR) is a cross-UCL Institute, which leads research, knowledge exchange and teaching in the area of risk and disaster reduction, spanning earth and space sciences, statistics, engineering and development planning, global health, environment, climate and water, social science and gender studies, and contributes to UCL’s Grand Challenges. It has a leading role in the UCL Humanitarian Institute. 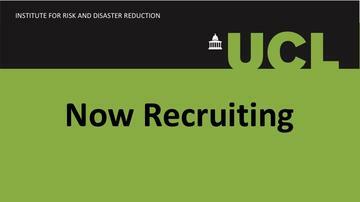 The main purpose of the job is to carry out research, teaching and administration within the UCL Institute for Risk and Disaster Reduction, especially in the areas of risk and disaster science.This is an open-ended academic position. We are seeking a PhD educated expert with excellent transdisciplinary knowledge of risk and disaster science, including the physical sciences, modelling, scientific approaches to disaster risk reduction, assessment of vulnerability, and statistical underpinning of natural and anthropogenic hazard risks. These risks include (but are not limited to) geophysical, hydro-meteorological, climate-related, health and technological hazard risks. They should have an excellent research profile, and strong teaching and communication skills. The candidate should be able to work collaboratively, be committed to academic research, and work harmoniously with colleagues and students of all cultures and backgrounds.